Join your fellow Porsche Club of America members at the 62nd Porsche Parade on July 9-15, 2017. 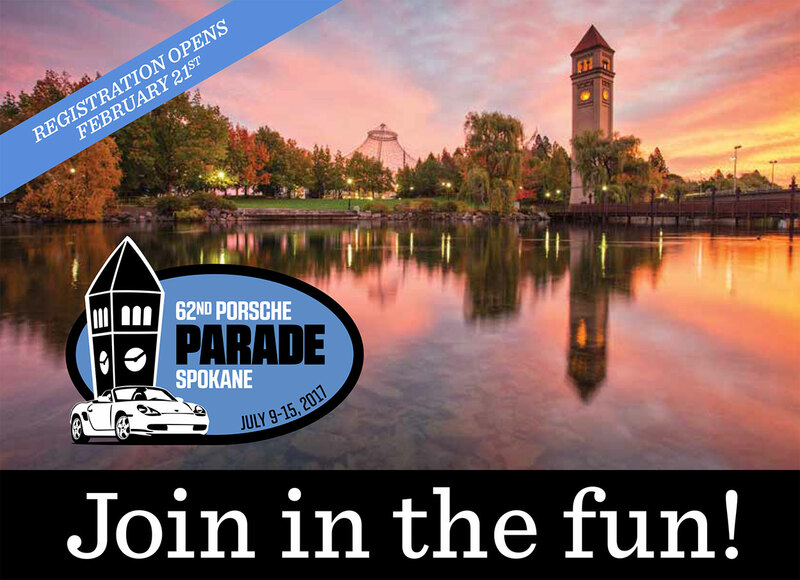 Parade is PCA’s annual, weeklong event enjoyed by several thousand of your fellow members, who will gather this year in Spokane, Washington. Parade participants will enjoy driving tours and a gimmick rally to explore eastern Washington’s mountain vistas and high desert, the concours at Riverfront Park, an autocross, a time-speed-distance (TSD) rally, and a technical/historical quiz to test your competitive spirit. When you want to step away from driving, Spokane is a walkable city with award-winning eateries, the Cork District tasting rooms, craft breweries, and boutique shopping. Bring the kids, too, as they’ll be kept busy with activities such as model Porsche concours, radio-controlled car racing, and an ice cream social (well, adults can join in the ice cream, too).